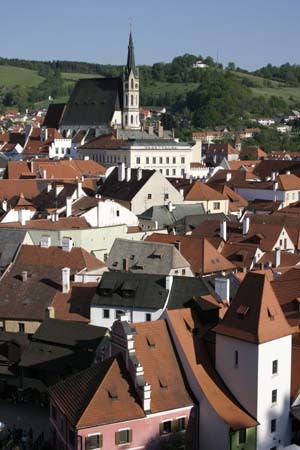 Czesky Krumlov, Czech Republic will be one of the stops on Jim’s first tour of the season. May 23 to June 8: Bob and Marlene return for their second trip with European Focus (their first was an ancestral discovery tour in Germany in the summer of 2006) and this time we are revisiting some favorites from their ’06 trip (like the village where the current pope is from!) as well as Marlene’s father’s birthplace in Munich. We’re going to visit Budapest and Prague as well. June 11 to 19: Margie returns for her third trip with me on the trail of ancestors in Germany. We will be in Rheinland-Pfalz and in the area up near Hannover. June 18 to 30: The Bassford/Albrecht/Nelson family comes to Paris to meet with Jenean for an exciting three night stay. Then Jim hooks up with the group in Burgundy, France for the continuation of the adventures into Germany. July 3 – 9: Jim and Jenean will be scouting in Portugal, preparing for future tours and also, buying pottery for their shop in Sarasota. July 11 – 19: Jim and Jenean will be doing photography projects for clients in Germany. July 21 to August 2: Our favorite family returns for their 7th trip since 2003. Clara and her “crew” of five will explore various regions of Germany where ancestors lived before emigrating. August 3 to 23: A new experience for this family from the Midwest, and their first trip with European Focus as we spend three weeks exploring southern Bavaria including Schwangau, Berchtesgaden, Regensburg, Rothenburg ob der Tauber as well as the Rhein Valley and the ancestral village of Runkel. We also spend quality time in the area near Paderborn, another ancestral home. We visit Erfurt and Eisenach in the former DDR and then spend two nights in the heart of Berlin. The trip wraps up with visits to Dresden, Hohenstein-Ernsthal and Landshut. September 7, 8 and 9: A couple from Minneapolis tour four small villages in Rheinland-Pfalz with Jim. They’re going to spend just a short time in Germany during their Grand European Tour and Jim is there to help them get the very most out of their time. September 10 – 20: An 84-year young lady, also from Minnesota, comes over to fulfill her dream of visiting her grandmother’s birth town of Netra, Germany. We’re also going to take in the sights in Gelnhausen, Dresden, Meissen, Leipzig, Regensburg and Berchtesgaden. September 21 to October 3: A family of four will experience our kind of travel for the first time as we start off in Munich and then head for the alps and Garmisch-Partenkirchen. We also take in one of the most beautiful alpine drives in Europe as we make our way from Garmisch over to Berchtesgaden. We see Regensburg, Rothenburg ob der Tauber, the tiny village of Bacharach on the Rhein and Koln before our final night in Nierstein. October 5 to 12: Dena and Grace return for their 2nd trip with me. Like the first, this one will be mainly for genealogy purposes. We will be in the north and central parts of Germany. October 12 to 19: Betsy and Jim Cook come to Germany for a short tour to along the backroads before their river cruise, which starts in Strasbourg. October 19 to 28: The Fox family (4) come to Germany to see some places where their ancestors lived before emigrating. We will also visit two small villages in the Alsace that Jim photographed for Lisa Fox a number or years ago. It will be fun to show them these places in 3-D! November 5: Jim returns home. Season ends.